AECG100-1R-525 The test system includes AECG100 main console unit with ECG module and PPG-1R-525 module. Support ECG/PWTT/PPG/Auto Sequence test modes. 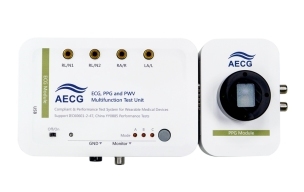 AECG100-2R-940 The test system includes AECG100 main console unit with ECG module and PPG-2R-940 module. Support ECG/PWTT/SpO2/PPG/Auto Sequence test modes. AECG100-2R-880 The test system includes AECG100 main console unit with ECG module and PPG-2R-880 module. 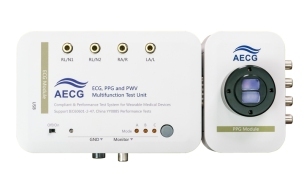 Support ECG/PWTT/SpO2/PPG/Auto Sequence test modes. AECG100 AECG100 main console unit with ECG module. 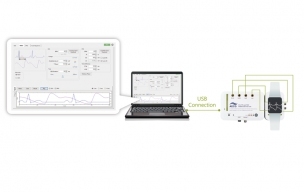 Support ECG and Auto Sequence test modes. AECG Assistant-E47 Auto setup for IEC60601-2-47:2012 performance tests. AECG Assistant-YY0885 Auto setup for YY0885-2013 performance tests. AFDB-AECG Playback capability of 40 clinical-recorded PPG databases, including AF , APC , VPC and 1st AV block.